Everyone deserves legal protection. 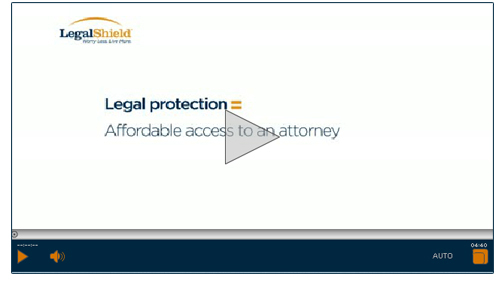 And now with LegalShield, everyone can access it. No matter how traumatic. No matter how trivial. Whatever your situation is, we are here to help. From real estate to divorce advice, identity theft and beyond, we have your rights covered. Welcome to total piece of mind. Welcome to LegalShield. With the commitment of 1.4 million LegalShield members, we are able to negotiate comprehensive legal services with dedicated law firms nationwide at a fraction of what they traditionally cost. Because out attorneys aren’t waiting to get paid, and instead are prepaid, they’re motivated to treat all of our members and their needs equally. Proven, professional advice is just a phone call away on all matters, from the trivial to the traumatic. 24/7 Emergency Assistance – After-hours consultation for covered legal emergencies such as: if you’re arrested or detained, if you’re seriously injured, if you’re served with a warrant, or if the state tries to take your child(ren). Assistance if you or your spouse is named defendant or respondent in a covered civil or job-related criminal action filed in court. You may continue to use your Provider Law Firm for legal situations that extend beyond plan coverage. The additional services are 25% off the law firm’s standard hourly rates. Your Provider Law Firm will let you know when the 25% discount applies and go over these ‘fees with you. Contact Perry G. Walker Accounting & Tax Service today at 704-717-6244 to schedule your appointment.